Management commitment is a term we hear frequently from regulatory agencies, in forum discussions, in training and from our peers and mentors. I often wonder if we really understand how to define it and the steps required to incorporate it into our safety programs. We should first preface this article with a message of encouragement to not give up and understand that this can be a significant challenge. All things considered, the reward in the end will be a more profitable, safer and overall, better place to work. Develop and Support a VSP – The acronym VSP stands for Vision, Strategy and Plan. The path to success starts with being able to answer one simple question – “Why am I doing this initiative?” That answer formulates the genesis of your vision statement. From there, specific strategies are developed along with plans to support those strategies. Being committed as a manager means that you participate in the development of the VSP as well as evaluate and help coach to improve on each component. Without having this in place, it’s nearly impossible to gauge success if you are to focus on more than just failure metrics such as incident rates. Support Safety Initiatives and Participate – Management should learn all they can about a safety initiative and ask questions so they can participate in meetings and discussions. When the employees see that management is familiar with the initiative and talks to them about it, it becomes more than just a “safety initiative”. Seeing leadership include initiative- based discussion points into their meetings and communications and real time action, an employee is more easily convinced that positive change is occurring. Imagine the impact it has when senior management goes onto the shop floor or in the field and works hand in hand with the employee, if even only for a portion of the time. Finance – Companies are in business to make money and management has to reinvest a portion of that money into the day to day safety of the business. When employees see that management is investing to develop safer processes, they will be more inclined to take a vested interest in corporate sponsored programs. New paint, better housekeeping, guarding and tools and equipment that are in good repair speak volumes about investment. An organized training program where employees aren’t required to work a 12 hour shift and then stay 4 hours later for training also shows that education is valued just as much as work productivity. Lead By Example – This is part of the process of supporting initiatives. As a manager, it’s not okay to hold yourself to less of a standard than is expected from the employees. If a manager is giving a tour and the requirement is that all visitors are to submit to an orientation, that step needs to be followed. If a foreman is helping to write a JSA for an excavation and allows it to be completed without trench support where it’s needed, it sets the example that it’s okay to circumvent safety procedures. I’ve always lived by this saying: “I focus on what my manager focuses on”. Coaching & Feedback– To be a coach as it relates to safety means to observe an employee while at work and then give honest and respectful feedback to help them improve or encourage continued safe work performance. The correct way to do this is to go to the location where the work is taking place and have a conversation with them about the tasks. This is done to avoid any speculation about why the manager might be there. During this conversation, the manager learns the key aspects of the work if they’re not already familiar with it so that they can be objective in their assessment. The goal is to create an interactive, caring and positive experience that builds the relationship and reinforces why the incorporation of safety into the workplace is so important. Reward and Recognize – The old adage of “what gets tracked gets done; what gets rewarded gets done better” applies. Even though it’s the job of the employee to perform their jobs as expected, we can all agree that it’s nice to be recognized. Rewarding employees for reaching a milestone or a goal increases morale and happier employees are more productive. Something as simple as a manager verbally recognizing the work of an employee reinforces the appreciation that a company should show for their employees. It can also help an employee think less about job security at a time where markets have instability. In periods of profitability and high workloads or in cases of an underdeveloped culture, it’s easy to forget about the employees and focus on the dollar, but that doesn’t contribute to long term success. The management team has an enormous responsibility to achieve profitability and be a role model to all of the employees. There’s no doubt that this is a challenging task but it is achievable. The management team has to place a concentrated effort on the people of the organization and put them first. Once that’s mastered, success in safety and other aspects of the business will come much easier. 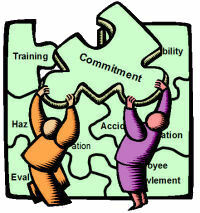 Management commitment, after all, is more than mere words - it is the action that speaks the loudest.